Phytoplankton, plant-like organisms floating near the surface of the water, converts sunlight into food - Phytoplankton is eaten by zooplankton (animal-like plankton), which is eaten by small fish, which themselves are eaten by bigger fish. Thus, all fish obtain their sun-derived, electron-rich, Omega-3 fatty acids from eating plankton or other fish. Fish need a diet of between 1-2% Omega-3 fatty acids to grow normally - which for farmed fish is obtained from a diet of ~30% fish meal / 10% fish oil of small fish. Since this source is being tapped out, the industry has more recently been challenged to find alternative food sources, and have turned to plant proteins as a substitute. Fat content of the fish then corresponds to the plant oils, with their lowered Omega-3 content. ✔ALL trout in U.S. markets are farm raised (mainly from Idaho and N. Carolina) in fresh water troughs - Their feed of oily fish, such as anchovy, herring, menhaden, and mackerel determines their high Omega-3 content. Other feed ingredients in their generalized (usually proprietary) diet are poultry by-product meal, soybean meal, and wheat grain. Ideally, we should be able to get EPA / DHA directly by eating oily, ocean or freshwater fish. Farmed salmon contain an average of at least 5 times higher contaminant levels than wild salmon (particularly antibiotics, PCBs and toxaphene). 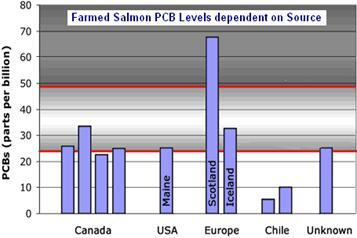 Even the lowest contaminated Atlantic farmed salmon from Washington State and Chile had significantly higher contaminants (pcbs, dioxins and dieldrin) than wild Pacific salmon. In addition to accumulating toxins from their feed, Farmed salmon receive drugs to control parasites and promote growth,and more antibiotics by weight than any other livestock - Even so, all salmon were found below WHO, EPA and FDA action levels, and therefore considered safe to eat. Major producers of farmed salmon are Norway (43%), Chile (26%) and U.K. (13%). In the U.S., farmed salmon comes from Chile (56%), Canada (31%), U.S. (6%) and Europe (7%) - Most contaminated salmon come from Europe. This data taken from a comprehensive study published in the journal “Science” in 2004 (Hites et al), conducted on 700 farmed and wild salmon (~ 2 metric tons) collected worldwide. ✔ Primarily eat a high-fat feed of fish oil and fish meal/pellets - made from ground-up small fish, such as anchovies. ✔ Contain higher levels of saturated fats and omega-6 than wild salmon (USDA) -twice as much saturated fat as wild Pacific pink or chum salmon. Processors intentionally fatten the salmon to maximize market weight. ✔ Farmed fish also have higher Omega-6 fat content. ✔ Farmed Salmon in the Pink - Farmed salmon are fed pigment-fortified pellets, chemical dyes added to color their flesh anappealing salmon pink; otherwise the flesh would be grey... a merchant may even get to pick the exact shade of pink! Two 1970 Russian studies on Red Dye #2 showed that extremely small amounts of it caused birth defects, stillbirths, fetal deaths, and sterility in rats. ✔ Atlantic farmed salmon contain 1500-2500 mg Omega-3 fat in ~3.5 oz portion. ✔ Eat a large variety of aquatic organisms - such as krill, zooplankton (e.g. larval stage of crustaceans, mollusks, fish), and small fish. ✔ Wild salmon has the genuine and powerful antioxidant-rich orange coloring astaxanthin. ✔ Wild chinook salmon contains 1250-1800 mg Omega-3 fat in ~3.5 oz portion.